Fentanyl, one of the most widely used synthetic opioids in clinical practice, has become a widespread drug of abuse and has played a central role in the growing opioid epidemic. With a potency 100-times that of morphine, fentanyl can prove lethal in small doses. Using a fully-automated design pipeline, we have generated high-affinity fentanyl sensors capable of detecting environmental fentanyl. Our approach employed a fast docking algorithm to find shape complementary ligand placement in protein scaffolds, followed by design of the surrounding residues to optimize binding affinity. 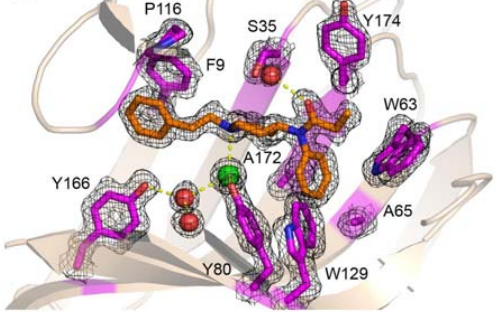 Co-crystal structures of the highest affinity binder revealed a highly preorganized binding site, and an overall architecture and ligand placement in close agreement with the design model. 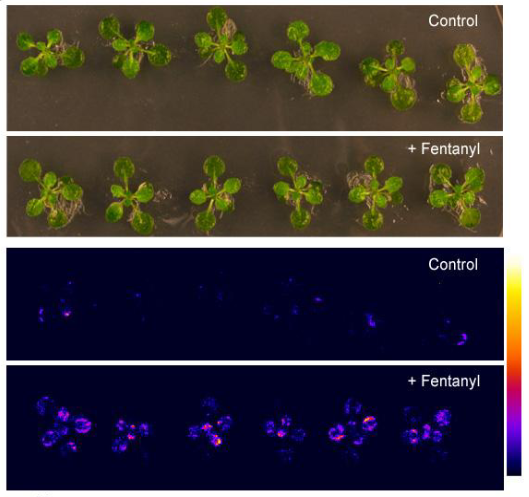 We used the designs to generate plant sensors for fentanyl by coupling ligand binding to design stability. Our method should be generally useful for detecting toxic hydrophobic compounds in the environment.